We moved into this house back in March, 2003, twelve years ago this month. Which, when I think about it, is longer than I’ve ever lived in any other house. If I do the math, it turns out I’ve spent just shy of one-quarter of my life occupying these rooms. Add in a couple of years worth of thought and planning and about nine months of building, and this house has been the hub of my existence for a substantial portion of my life. For me, statistical curiosities like this tend to flare pretty briefly on the “Interesting” scale: Huh. I’ll be darned. And then my brain is off looking for something more…amenable to interpretation, I suppose. Less conclusive. More quirky. Such as this: Given that I’ve lived here longer than in any other home, why do I persist in calling this our “new” place when talking to people who have known me for a long time? 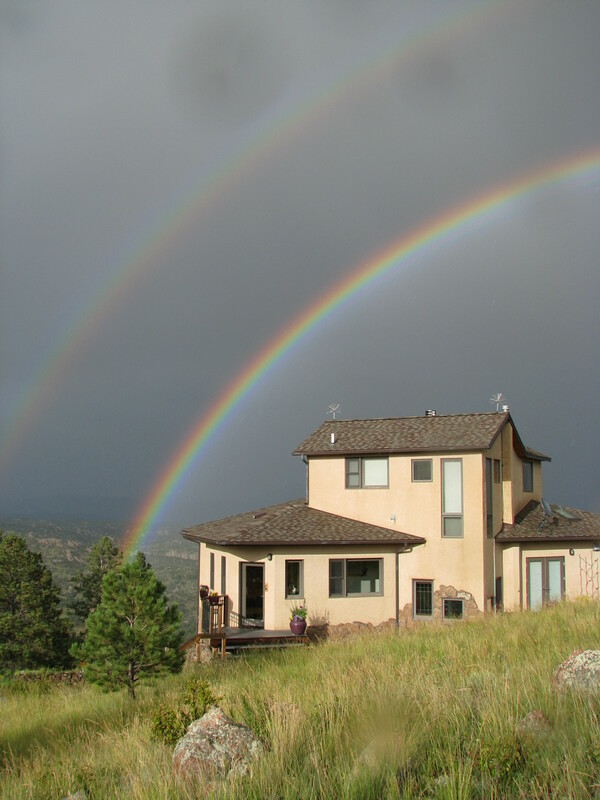 In part, that’s a term of descriptive convenience: our “new” place, in central Colorado north of Cap Rock Ridge, is not to be confused with our “old” place, the house in Fourmile Canyon west of Boulder that Doug and I lived in before we moved here. The temporal-geographical explanation has just enough basis in reality to be plausible, but there’s something else going on. The psychology of this persistent “new” isn’t rooted in the word’s connotation of recentness. I’m pretty sure my skewed vocabulary is trying to voice a different truth, one in which newness pertains to that which is uncharted and fresh. When we moved here in 2001 to begin building the barn/cabin we would live in before we built the house, I arrived with a plan. I had in my mind a writing project called A Year at Home, which would chronicle our transition from the urban margins of Boulder to this rural property. I would write about my explorations of my new home place, would reflect on discoveries and challenges with a focus on natural history observations. I wasn’t naive enough to think that it would only take a year to compile the observations that would anchor the narrative, but I envisioned the annual cycle as an organizational device. As we settled in and began to set up our new lives and rhythms, I made a commitment to paying attention to what was going on around me. I stuck to that goal as best I could, watching the weather, the birds, the deer and chipmunks. I smelled wildflowers and mud and dried grasses and smoke from wildfires. I listened to the wind and to the ravens and to cattle and to the lusty wailing of bull elk in the fall. I observed the landscape and the sky in different seasons and shades of light, in dry years and wet ones. I kept a journal, made notes, continued hold myself to the expectation that paying attention in preparation for writing about my surroundings was part of my job—alongside supervising construction workers, establishing a garden, and improvising a working-life dance with my husband so we could support the whole endeavor financially. When the contractors left, we did finish work on the house and then plugged away at masonry and landscaping, projects that stretched for years. We entered into an annual round of chores: maintaining the garden, cutting firewood, hauling hay, plowing roads, pulling weeds. Throughout and in between, I kept at my original job, looking up from my desk now and again to check the view out the windows. When I was outside, I tried to stay alert for the notable, whether I was working or walking or riding. The year at home stretched to a near-decade. After struggles, fits, and re-starts, I assembled a scrawny manuscript. The one-year structural device seemed absurd by then, so I renamed the project The View from Home. Another four years later, slightly plumper and now titled Between Urban and Wild, the book came out. I had, finally, made good on my plan. I kept my old job, though, as a self-employed observer. As I enter the thirteenth edition of my year at home, I keep hearing and seeing and smelling nuances I hadn’t noticed before, finding my place, perpetually, anew. This entry was posted in home, observation, working from home, writing and tagged attention, Between Urban and Wild. Bookmark the permalink.